Folk-rock artist Rain Perry has some important questions about the music industry, so she’s chosen celebrated music producer Mark Hallman to be the subject of a new documentary. 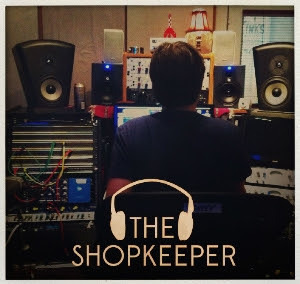 The Shopkeeper takes us to Austin TX, where, after 35+ years in the business, Mark Hallman is still making music in his studio, The Congress House. How can Mark’s life path (a songwriter turned producer) help answer questions about the state of things now? How can artists make a living in the age of Spotify? How has technology influenced artists and audiences alike? Rain sits down with No Film School to discuss being a “noob” to filmmaking, how it compares to creating music, and important lessons she’s learned so far. Perhaps widely known best for Beautiful Tree, the theme song to Life Unexpected, Rain Perry has an individual power to harness and captivate an audience, but does that quality translate to filmmaking? So I thought: here's an interesting opportunity to talk to someone who's making the transition into filmmaking, ask what she's learning and find out how her process is developing. All I know is that Rain is busy, she released her fourth album last year, she teaches, has two kids -- but all of this informs her when engaging her audience. She has a personal touch to everything that makes her an ideal collaborator. Her subject Mark Hallman is an Austin legend who's produced some iconic musicians, amongst his laurels the likes of Carole King, Ani DiFranco and Oasis. While the multi-instrumentalist Hallman plays on most of the records he produces, his real instrument is The Congress House Studio. A modest, relaxed haven tucked away in the forests of Austin, the studio is literally "homey." But despite having produced over 60 artists, Mark has been put in a tight spot by the fickle state of the music industry. Is it possible to run a small, intimate studio in the age of downloads and Spotify? "Knowing also that it's still yet to be revealed, I kinda know not where it's going but how I'm getting there." NFS: Where did you start when grappling with the idea of making a movie about your producer? Rain: I had no idea where to start at all. I was a noob. And then we went to Austin and I found that it wasn't that much different from how we start with a record. That's how Mark works; we pick a song and we just start going. But he was my producer and I was the artist. In this case our roles are sorta reversed. And it's fun! I'm enjoying that aspect of it, creatively. I have artistic control on my records, but Mark is outside of me having a perspective I can't have, because I'm busy being the artist. So it's kinda fun having him be the victim. NFS: He's the star this time! Rain: Yeah which he kinda loves in some ways and is also kinda horrified by. "I've been watching tons of documentaries and seeing how people do it, and seeing how much you can rely on just using audio." NFS: What are the first three roadblocks you encountered when starting this film? Rain: At first it was so daunting, it was just too much. How do I get a grip on everyone Mark worked with, etc. But now, like with everything, after a while you start to get a sense of mastery with the subject matter. So I know the arc of his life, his experiences and how he got to where he is. And I'm starting to understand which quadrants of his story are important to the movie and which ones aren't. It's just starting to come together. NFS: Yeah, it's finding direction. You throw a boat on the ocean with a sail and you throw it up and say "go!" Rain: I wasn't sure I could do it, but I quickly found that the way I put songs together in a record wasn't that much different from looking for the pieces of a story. And I wasn't sure I even had a story, but after we shot for a weekend and I started to transcribe everything, it just began to reveal itself to me. And remember I talked to you about the feel of the movie and setting up these stylistic components. The interviews, the B-roll, and once we were filming that stuff it clicked. Plus I've been watching tons of documentaries and seeing how people do it, and seeing how much you can rely on just using audio. You can get so much information in with archival stuff and people talking under it. NFS: What things have you learned to do in interviews that help lead them to where you wanna go? Rain: I learned that while I'm in the process of interviewing I have no idea what someone is saying. I really think that I remembered, but then I go back and watch the footage and there was something brilliant or amazing that was said. So what I'm learning to do is to let myself follow people down the path they start. Let them tell me things I didn't know they would say. Just being flexible is important. It's just getting more and more nuanced the more I do. "Unless you're living with a Kardashian level of cameras with you all the time, how do you forget? How do you get those real moments?" NFS: As someone who's never made a film before, but wants to interview some high-profile people, how are you approaching that issue? Rain: Two things: The first is just getting over my fear of just asking. It's a lot easier because I'm doing it for Mark in a way. Making a movie about someone who a lot of people really care about makes it a lot easier, but it's for something bigger than just me and my record, or whatever. The second is, for some subjects that are really elusive, just letting go a little bit. There's one person that I would love to interview for this film, but it's just out of my control. There's no easy way to force it. Rain: -- It'll happen or not. NFS: You've known Mark for years. What has about bringing cameras into the equation do to the dynamic of the relationship? Rain: I could tell just watching Mark that he's aware of the cameras, which is going to be a challenge actually. Unless you're living with a Kardashian level of cameras with you all the time, how do you forget? How do you get those real moments? When we go back [to Austin] one thing I wanna do is just have a dinner party, just his close friends and we're just gonna talk and forget about the cameras.